Molecular mimicry is the theory that bacterial cells or other microbial “triggers” have a similar appearance to the cells that make up parts of our physiology or “self” antigens. When an infection occurs, these infectious cells are recognized as foreign. This is really great for getting rid of the infections, but sometimes the immune system targets proteins in the infectious cells that resemble the proteins in our own cells. This inadvertently causes a cross-reaction with our “self” antigens, i.e., our own cells. This case of mistaken identity is thought to trigger the start of autoimmunity. One example is Streptococcus pyogenes. This is the bacteria that causes the common throat infection known as “strep throat”. In some cases, especially when the infection is not treated with antibiotics within two to three weeks, the immune system will start launching an attack against the Streptococcus bacteria. Unfortunately, a component of the bacteria’s cell wall resembles that of the human heart valves, and this results in the immune system attacking the human heart valves in a case of mistaken identity. This reaction is known as rheumatic fever and can be deadly and often necessitates heart valve transplants. Arnold Schwarzenegger is probably the most well-known person who was affected with this condition and has had to have heart valve transplants as a result. Which Bacteria Have Been Associated with Triggering Hashimoto’s? A variety of bacterial infections have been implicated in triggering autoimmune thyroiditis, including Helicobacter Pylori (the same bacteria that causes ulcers), Borrelia burgdorferi (associated with Lyme disease) and Yersinia enterocolitica. Antibodies to Yersinia (indicating exposure) in people with Hashimoto’s were found fourteen times more often than in people without Hashimoto’s. Yersinia membranes contain a site that binds TSH, making it a prime suspect based on the molecular mimicry theory. Infection with this bacteria can induce antibodies against sites that recognize and stimulate TSH receptors, like the thyroid peroxidase enzyme or thyroglobulin. People can contract a Yersinia enterocolitica infection from contaminated meat, poultry, dairy products, and seafood (especially oysters). In 2012, a consumer group found that 67% of pork sold in the U.S. was contaminated with Yersinia!! Physicians can run blood tests, stool antigen or breath tests for H. pylori. If you cannot find a physician that will run the test for you, you can also order your own labs tests via direct to patient lab testing that I have set up through Direct Labs. You can find a practitioner near you who believes in the root cause approach by downloading my free guide here. Borrelia is available as a blood test, while the presence of Yersinia can be tested by a comprehensive stool analysis by requesting Yersinia to be added to the test panel. New autoimmune theories have established that once the antigen (trigger) is removed, the antibody production goes away and the innocent part of our bodies (in the case of Hashimoto’s, the TPO enzyme) is no longer a target. In the case of infections, once the infection is removed, the TPO should no longer be a trigger once the immune system recognizes that the infection is gone. 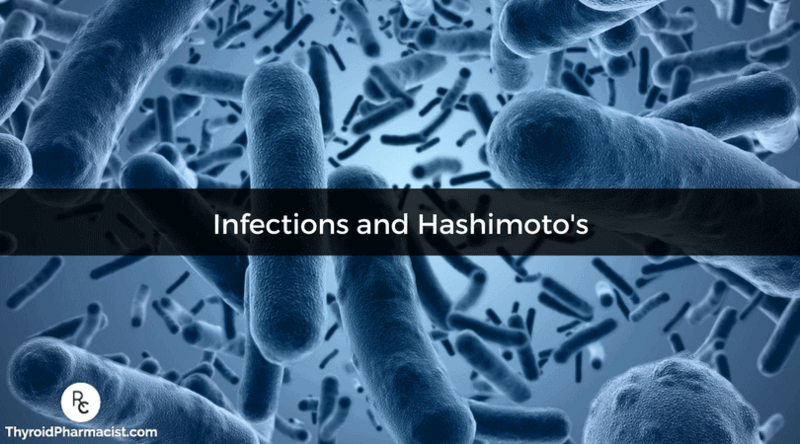 Thus, treating infections may help to heal Hashimoto’s. In other cases, the infection may be gone and the immune system may need a reboot. Some individuals have reported the normalization of thyroid peroxidase antibodies following taking the antibiotic doxycycline, which is effective for Yersinia enterocolitica and borellia burgdorferi as well as other bacteria. Work with your doctor to test for infections, and use antibiotics judiciously, as they can be incredibly dangerous when used incorrectly and lead to multi-drug resistance, an elimination of the beneficial bacterial flora and numerous side effects. There is a multitude of different antibiotics, each with a different group of bacteria they target, and each with their own set of side effects. Blindly taking antibiotics without knowing the cause of your infection may end up inadvertently destroying the beneficial bacteria while letting pathogenic and opportunistic bacteria thrive. Be sure to supplement with probiotics during courses of antibiotic therapy, but at different times throughout the day so that the beneficial bacteria in the probiotics are not killed by the antibiotics. Work with your pharmacist to find out the half-life of your antibiotics and to find an optimal time to take probiotics. If there is a pressing issue for you, send me a message or leave a comment, I am here to help. NOTE: These statements have not been evaluated by the Food and Drug Administration. The products discussed are not intended to diagnose, treat, cure, or prevent any disease. The medical information in on this blog is provided as an educational resource only and is not intended to be used or relied upon for any diagnostic or treatment purposes. This information should not be used as a substitute for professional diagnosis and treatment. Please consult your health-care provider before making any healthcare decisions or for guidance about a specific medical condition. Thanks a lot for the info. I do have been tested for helicobacter pylori with positive result. What I don´t understand is why to use a Proton Pump Inhibitor to make the stomach less acidic, as I have read that h. Pylori lower itself the stomach acids and this is why we have digestion issues. Also I wanted to ask you if you have heard that magnetic therapy can kill bacterias without harming our body. it mainly consist on being putted some magnets on our body by a specialist in this therapy. Could it be truth? Mundana- I highly recommend that you work with a functional medicine clinician. It’s a whole medical specialty dedicated to finding and treating underlying causes and prevention of serious chronic disease rather than disease symptoms. Yes I have had bimagnet therapy for h pylori and recurring strep bacterial infections and it really works! You have to see a therapist that studied with Dr Goiz! Great overall article, but you are wrong about hpylori liking an acidic environment. The opposite is true. Hpylori does not like an acidic environment and not only avoids it in the stomach (by burrowing into the lining) but also releases urase to neutralize the acid in the stomach. Using a PPI would only make the stomach more habitable for hpylori. Also having low stomach acid is a problem for many people (because of PPI and other reasons) and can lead to leaky gut. Bet, i was confused after having taken the antibiotic a proton pump inhibitor(which by the way I am and was totally against them wish I would have taken time to find a natural way to kill the h pylori) for my H pylori infection. Because about 7 days into the 14 days of treatment I started to have pain in my right arm from the top of the arm to the tip of my middle finger. I quit taking the proton pump inhibitor because I started researching on the round of medicine for the infection. Also found a book by Jonathan Wright called why we need stomach acid and he went into great detail about h pylori infection and how to get rid of it. Anyways back to what I was saying about my arm, I have had joint problems in my middle finger on that side since overtime I eat something that is inflammatory. I didn’t have these issues prior to taking these meds so I think that they triggered an auto immune onset for me. So if possible I would suggest people to try the natural herbs first. Our bodies are already compromised with the infection and then we take the round of antibiotics with the proton inhibitors and in some cases this can be the onset of auto immunity. I agree with you that the infection causes low stomach acid so why have to take it orally with the meds?? Melanie – thank you for following this page and for sharing. I would usually try natural therapies for H. Pylori, like mastic gum, but providing the info about the meds for those that do not benefit from herbals or prefer the RX route. I also agree with you on the low stomach issue. I am very much against using PPI’s for acid reflux, as I believe that most of us do have low stomach acid. Additionally, and H. Pylori infection lowers our stomach acid further! I have been diagnosed with having the antibodies for H.Pylori based on a blood test. My Functional Dr says that he has a tea that is very effective in treating it and my Dr. recommends the antibiotics and acid suppressor. What is your opinion in which is more effective to treat H.Pylori? Angeline- the antibotics are more powerful, but also have the potential to cause more damage due to killing off beneficial bacteria and side effects. S Boulardii, a probiotic has been found to be helpful when taken in combination with antibiotics and would likely be helpful with herbals as well. I have confirmed H.Pylori and did the spit test for candida and am pretty sure I have that too. Are you aware of anyway to knock them both out at once or do they have to be treated one at a time? Hi Izabella, I was wondering what brand of mastic gum you recommend? Also how much of a dosage? Melanie – thank you for following this page. I cover Mastic Gum dosing in my book on page 314 of Hashimoto’s Protocol. Have you taken a look? Kerry- Work with your doctor to test for infections, and use antibiotics judiciously, as they can be incredibly dangerous when used incorrectly and lead to multi-drug resistance, an elimination of the beneficial bacterial flora and numerous side effects. There is a multitude of different antibiotics, each with a different group of bacteria they target, and each with their own set of side effects. Blindly taking antibiotics without knowing the cause of your infection may end up inadvertently destroying the beneficial bacteria while letting pathogenic and opportunistic bacteria thrive. How much oil of oregano do you suggest? Tam- Work with your doctor to test for infections, and use antibiotics judiciously, as they can be incredibly dangerous when used incorrectly and lead to multi-drug resistance, an elimination of the beneficial bacterial flora and numerous side effects. There is a multitude of different antibiotics, each with a different group of bacteria they target, and each with their own set of side effects. Blindly taking antibiotics without knowing the cause of your infection may end up inadvertently destroying the beneficial bacteria while letting pathogenic and opportunistic bacteria thrive. I’ve been reading a lot on Hashimoto’s, diets, and also finding your root cause. When I did some notes following your dig-at-it exercise – I came to a conclusion that it must be my tonsils – could it be? I’ve had tons of problems with them as a kid (a lot of infections, antibiotics, etc) and now, me being an adult, they seem to have been infected for years but nothing has been done with them at any point (once I was told to rinse my throat with some herbs but it didn’t make any change). In March of 2013 my 11 year old son became very sick. The diagnosis was strep and scarlet fever. The doctor game him Clindamycin and two days later he had horrible pain behind his knees, and it began to migrate all over his body. Two weeks later I got the same thing, then it was passed onto his twin brother, all while my husband was deployed. Our stomachs were a mess and we could barely function. This went on for months followed by a few good days and then a few very bad. We were tested for everything, but no once could come up with anything. We saw a chinese herbalist, acupuncture, you name it we tried it. Finally I saw an Integrative doctor and he found I had Hashimoto’s as well as enterobacteria and strep in my stomach (via stool test). He put me on bactrum (as I am allergic to penicillin) and I had a reaction of racing heart and anxiety like I’ve never known. The reaction stopped after more than 24 hours of being off the bactrum. He would like to put me on cipro, but I wanted to try Phytostan first. I guess I’m scared to take another antibiotic after the last episode, but I also don’t want to keep having intestinal issues either. Right now my TSH is in the normal range and my TPO ab was 106. Do you think I should take the antibiotic, or stay on the phytostan? I take a 50 billion probiotic twice a day, along with glutamine, selenomathianine, and nystatin. I have been very strictly gluten free for 3 months. Many thanks to any help you can offer! BTW, the twins and I still have random pains (jaw, knees, fingers, toes) from the “virus”, but it has gotten better. We still do not have our stamina back fully, which is insane considering it was almost a year ago! Tara- Did you know that if you live in the United States, the UK, Australia, Europe and most developed countries that add iodine to the salt supply and take thyroid medications, there’s a higher probability that you do have Hashimoto’s? Are shingles associated with Hashimoto’s? Are there any supplements that will help with treatment once you have been diagnosed with shingles? Bonita, you can try olive leaf extract for shingles. It is a strong antiviral. Also add other antivirals such as garlic, l-lysine, turmeric, boswellia. It tends to flare up with stress so you may want to see how to build up stress resistance and immunity. Also topical antiviral essential oils. Although, there’s been much improvement, I still need to address the bone loss and gums. Thank you so much. Your book was very helpful and I have recommended it to a few Hashi’s patients as well. I’m awaiting results from my “GI effects complete stool test” (I was supplement-free for 3 days prior to test). I take almost all of the supplements you recommend, including both VSL#3 and Betaine HCL with Pepsin. But I’ve read somewhere that the HCL can lessen/negate the effects of the probiotics in general. Does the HCL negate the VSL#3 probiotics, or lessen their effects? When I was supplement-free I was surprised that my reflux did not return full-scale, so I’ve cut back on the Betaine HCL to 1x/day. On a different matter, the VSL#3 pills get stuck in my esophagus frequently, despite drinking plenty of warm fluids, and even coconut oil to get it to pass through the esophagus. I wonder if that is a common complaint? Or, if it’s okay to open the capsule and drink the VSL#3 in water, etc. Thanks for everything, your book is my ultimate Hashi guide, it’s well-highlighted, sticky-noted, and broken-in. Update on the VSL#3 getting stuck: I’ve started taking it during my meals, so that I have enough food to move it down my esophagus. That has worked. I’d rather not open them up for the sake of convenience (I am taking many supplements), however the VSL3.com website states that the pills can be open up and spread on food, although it shouldn’t be hot food or hot liquids. Izabella, wow…thank you so much for all the help and research. I was diagnosed in 2012 but think I had it long before, maybe since 2003 or even 1998 (the years I gave birth, I had symptoms). My question about infectious organisms relates to viruses that go dormant but never get cured, like herpes. Does this affect hashi’s and is there anything that can be done about it? Jane- Thyroid tissue can regenerate, but the rate at which it does is not always predictable. Thus, some are able to stop the autoimmune attack on their thyroid and regain normal thyroid function. Others can reduce the dose of medications, and others will need to stay on the medications indefinitely. I’m currently working on some protocols to help with tissue regeneration. Where do you buy mastic gum and what brand is best? Curios, I have been told I have the herpes virus effecting my system, giving all thyroid issue etc…. but ive read you cant kill this virus? So what do I do? During flare-ups: Take 1000 mg three times a day with meals. These are really good questions, and I’m so glad that you both were brave enough to ask, because I wasn’t brave enough. I found a L-lysine product that I liked about 6 weeks ago, but I’m eager to know if Izabella even recommends L-lysine and/or other supplements/dietary tips for herpes suppression and also any research that supports a link between herpes and hashi. I was diagnosed with Hashi’s 4 years ago and doing everything I can with diet; supplements; thyroid meds; exercise; sleep. Back in Nov 2013, my joints were under attack (knees down into my feet), fever, and felt flu-like symptoms. Per one of my providers, she suggested to run a Lyme test. She has thought all along my symptoms were very Lyme-like. I ran a CD3, CD57 and it came back well below the normal range. So, one would assume I had Lyme. I retested 6 days later and everything came back within normal range. Almost three times higher. Since then, I continue to have joint stiffness, fatigue, endurance issues, balance, vertigo, etc. and my ANA is showing additional autoimmune in the RA/Lupus family. So, I was referred to a Rheumatologist for further testing for RA, Lupus. I recently had skin grafting on my gums (yeah, my oral health has been greatly affected too). I was taking doxycycline for 10 days post oral surgery and I had no joint issues whatsoever. So, I didn’t really make the connection until I google searched antibiotics and joint pain, which lead me to it’s a bacteria attacking my joints. Long story short, should I test for the 3 bacteria that are common in Hashi’s pts and then go from there? I thought I was chasing another diagnoses, but feel this is all caused by a bacteria that is not being treated in my protocol. Thoughts? I have been told by a Doc who treats Fibromyalgia and Hashimoto’s that I have an active virus called HHV-6. Today I am starting high doses of acyclovir. I have been taking small doses for many years to keep my shingles virus under control. He also wants me to take Zantac because the high doses of acyclovir may cause stomach problems. I am reluctant to take the Zantac so, I will try to go without it unless my stomach begins to be problematic. This doc is well known in the Fibromyalgia circles. His name is Dr. Daniel Dantini in Palm Coast/Ormond Beach, FL Do you have experience with treating viruses? Any thoughts on HHV-6 would be appreciated. Jeanna- I personally struggled with pain in the form of body aches and stiffness as well as carpal tunnel in both arms in 2010, when I was first diagnosed with Hashimoto’s. It was awful, I had to wear braces on both arms all day and even at night for about 6 months. I have a question about oregano oil. I’ve used it over the past few years as an antibiotic by applying it to the skin over the site of infection (such as on the gums), and I used to take caplets of it to try to improve my gut health, since I’ve had chronic candida problems for many years. Recently a friend told me she had read that one should not take doses of oregano oil because it may kill beneficial gut flora along with the bad. Do you happen to know if it’s safe to take orally, or will it cause greater imbalances than it cures? Also, if I’ve consumed pork and oysters, etc., over time and might have a Yersinia infection, is there a natural way to deal with that, as opposed to taking pharmaceutical antibiotics? I’ve had to take far too many of them in my life, and they’re likely a source of many of my problems already, so I’d really like to avoid taking any more. Thanks! Hillary- Be sure to supplement with probiotics during courses of antibiotic therapy, but at different times throughout the day so that the beneficial bacteria in the probiotics are not killed by the antibiotics. Work with your pharmacist to find out the half-life of your antibiotics and to find an optimal time to take probiotics. Berni- Work with your doctor to test for infections, and use antibiotics judiciously, as they can be incredibly dangerous when used incorrectly and lead to multi-drug resistance, an elimination of the beneficial bacterial flora and numerous side effects. There is a multitude of different antibiotics, each with a different group of bacteria they target, and each with their own set of side effects. Blindly taking antibiotics without knowing the cause of your infection may end up inadvertently destroying the beneficial bacteria while letting pathogenic and opportunistic bacteria thrive. Eric- Without going into too much detail, the first of the crucial defining moments in my disease development may have started during my undergraduate studies at the University of Illinois. Due to the communal living setting of dormitories (and less than stellar hygiene habits of most college students) I had recurrent strep throat infections and even contracted mononucleosis, a viral infection caused by the Epstein-Barr Virus (EBV), which is implicated in triggering many autoimmune conditions. I received multiple courses of antibiotics as well as flu shots (which may be associated with EBV infections), and started birth control for menstrual cramps. Dr. Izabella, I hope you are still checking this post. First, I would like to say, Thank You, for taking your time to research this and share it with others. God bless you abundantly. My question is about licorice and other supplements their estrogenic properties. On one of your article, you mentioned that hormones may be linked to autoimmune diseases. If that is one of the causes, would taking supplements like licorice or even garlic cause more problems? I was diagnosed with both Hashimoto’s and SLE. I have been busy reading your blog, and watching your video series. Although different diseases, both are autoimmune in nature and I am wondering if their root causes may have more in common thus the protocol could possibly be similar or the same. It may be wishful thinking on my part so that I can begin to implement one protocol instead of multiple protocols. I have one functional Doctor nearby. He is a Very nice man but not to keen on exploring much which is different than any of the doctors I watched in your videos. I’m sorry I got carried away and typed a lot more than I should have. I would love to hear your thoughts on estrogenic food and/or supplements if hormonal imbalance is one of the problems. I know you aren’t allowed to give medical advice but if it is allowed can you also share the length of time oil of oregano and berbere should be taken to eradicate bacteria, parasites, and candida? I read that you mentioned S. Boulardii should be taken twice a day for a minimum of 30 days but there was no information on the oil of oregano and the berbere. Do you have any information on Hepatitis C and Hashi’s? I was recently diagnosed and doctors and I believe it may be contributing to my thyroid condition. I believe it may be a major cause of most of my conditions (I have 5 now!). jennie- Here are a couple of articles you may find interesting. Hey I have been diagnosed with hashimotos recently and I m on supplementations since then.reading your article I believe it might be an infectious cause because I have had throat infections quite frequently and also gerd. Can treating them undo the hashimotos ? Pankaj- Thyroid tissue can regenerate, but the rate at which it does is not always predictable. Thus, some are able to stop the autoimmune attack on their thyroid and regain normal thyroid function. Others can reduce the dose of medications, and others will need to stay on the medications indefinitely. I’m currently working on some protocols to help with tissue regeneration. I have been reading your book and find it fascinating! It makes so much sense and is helping me “connect the dots” of the root cause of my Hashimoto’s Thyroiditis. You mention Thytrophin PMG supplement to be used as a decoy to attract attacking white blood cells and antibodies. What if, as in my case one has reoccurring EBV infections and antibodies for H. Pylori? If either of these were the triggers for the thyroiditis, would Thytrophin PMG draw the white blood cells away from the infectious agents or does it help clear the way for the white blood cells and antibodies to attack only the infectious agents and not the thyroid cells? I guess the short question is, is it safe to use Thytrophin PMG if you suspect the trigger for your Hashimoto’s Disease to be infectious agents? Marianne- Work with your doctor to test for infections, and use antibiotics judiciously, as they can be incredibly dangerous when used incorrectly and lead to multi-drug resistance, an elimination of the beneficial bacterial flora and numerous side effects. There is a multitude of different antibiotics, each with a different group of bacteria they target, and each with their own set of side effects. Blindly taking antibiotics without knowing the cause of your infection may end up inadvertently destroying the beneficial bacteria while letting pathogenic and opportunistic bacteria thrive. Hi , please can you help offer me some help and advice . I was diagnosed with under active thyroid two years ago . Since Christmas I have taken throat ear and urinary infections alternately plus shingles . I have zero energy weak legs dizzy plus brain fog can’t tolerate high temp . Also have a temperature most of the time plus other symptoms . I can’t even go for small walks as I collapse after it and sleep . Please can you help give me some advice as I am so worried . I’m only in my thirties and my life has stopped . An- Did you know that if you live in the United States, the UK, Australia, Europe and most developed countries that add iodine to the salt supply and take thyroid medications, there’s a higher probability that you do have Hashimoto’s? I’m assuming, based on this comment (please confirm) that eliminating iodine from the diet is what you’d suggest? I hear people claiming that high doses of iodine (Lugol’s) is important to support the thyroid; however, if I even eat small amounts of kelp powder, it makes my thyroid swell (I can feel the discomfort in my throat) and causes major mood swings. What is going on with so many people suggesting supplementing with this? Rachelle- I’m very hesitant in recommending iodine in Hashimoto’s. Although iodine serves as fuel for our thyroid and is very important in iodine deficiency hypothyroidism, Hashimoto’s is a different mechanism. It’s like pouring gas into an engine that’s on fire… that’s essentially what’s happening in Hashi’s, thyroid inflammation, and adding iodine to the mix before putting out the fire and fixing the engine may result in further damage to the thyroid. In those with a predisposition to autoimmunity, this has been documented time and time again, animal and human studies. I have spent 4 years researching this and have seen too many people suffering the consequences of adding iodine too soon. My approach is, let’s fix the engine first (usually a gut issue), and then add the fuel once we know that the engine is no longer on fire. Hope that you will check out my book. I have a whole chapter on the iodine controversy that references numerous studies as well as the work of Abraham and Brownstein. I have been treating candida, (strict diet, anti fungal and probiotics) for 6 weeks. My naturopath believes the candida is what triggered my Hashimoto’s. Is there an accurate test to determine the candida is gone? I just was referred to a gastro Dr and he gave me an antibiotic and stool softener after talking to me for 2 minutes. No tests, no exam. My “gut” tells me not to do it. I have Hashimoto’s and been having trouble tolerating ALOT of foods lately. I’m down to only a few veggies, meats. Any advice would be appreciated. Thank you for your invaluable information!! Cari-Lynn- Work with your doctor to test for infections, and use antibiotics judiciously, as they can be incredibly dangerous when used incorrectly and lead to multi-drug resistance, an elimination of the beneficial bacterial flora and numerous side effects. There is a multitude of different antibiotics, each with a different group of bacteria they target, and each with their own set of side effects. Blindly taking antibiotics without knowing the cause of your infection may end up inadvertently destroying the beneficial bacteria while letting pathogenic and opportunistic bacteria thrive. Hyrije- Graves and Hashimoto’s are both autoimmune conditions that affect the thyroid. They are thought to be closely related. Sometimes one turns into the other. The difference is the site of the antibody attack. In Hashimoto’s, the antibodies are found to thyroglobulin (in 80%) and thyroid peroxidase (TPO) enzyme (in 95% of people)-Hashimoto’s results in hypothyroidism and is usually treated with Synthroid and replacement hormone. Hello my daughter has high thyroid antibodies and diagnosed with hashimoto few month ago . For the last 5 years been having 4 to 5 UTI a year and took so many antibiotics ,,,, she is seeing an alternative dr and start working on her leaky gut inflammation and adrenal fatigue . She didn’t have any UTI for the last 9 month . Unfortunately she had one last week . She has low progesterone level and experiencing high level of testeserone loosing hair and hve facial hair and high libbido ,she is using apex supplements . Any suggestion to help her ? Rose- Work with your doctor to test for infections, and use antibiotics judiciously, as they can be incredibly dangerous when used incorrectly and lead to multi-drug resistance, an elimination of the beneficial bacterial flora and numerous side effects. There is a multitude of different antibiotics, each with a different group of bacteria they target, and each with their own set of side effects. Blindly taking antibiotics without knowing the cause of your infection may end up inadvertently destroying the beneficial bacteria while letting pathogenic and opportunistic bacteria thrive. Hi I did know if anything can help me. My TPO has been in the 2,000. I am allerg to most of antibiotics. I am on oregano oil, cat claw (TOA-free) carnivora,Teasel. My doc said not to “worry” about my TPO number. She thinks I have Lymes and candida. So far all this treatment as got me is a tummy ache. Any in put would be of much help. Carolyn- Here are two articles you may find interesting! I have Hashis and I had a blood test that said I have reactivad Epstein Barr virus. What do you recommend for adding this issue? My Dr is wanting me to do MAH ozone therapy. I just can’t find enough research about it. Patty- Without going into too much detail, the first of the crucial defining moments in my disease development may have started during my undergraduate studies at the University of Illinois. Due to the communal living setting of dormitories (and less than stellar hygiene habits of most college students) I had recurrent strep throat infections and even contracted mononucleosis, a viral infection caused by the Epstein-Barr Virus (EBV), which is implicated in triggering many autoimmune conditions. I received multiple courses of antibiotics as well as flu shots (which may be associated with EBV infections), and started birth control for menstrual cramps. I was diagnosed with Hashimoto’s thyroiditis in 2008 and in the same year I contracted parasites from bad water namely Blastocystis species and Dientamoeba species. I am wondering if the molecular mimicry theory can be applied to these organisms as well. Could these parasites have triggered the antibodies to attack my thyroid? Lila- Here is some information you may find interesting. I feel right at home here with all the comments. I have been diagnosed or rather misdiagnosed for over 20 years. I believe my problem has been Hashimoto’s and viral/bacteria/parasites or candida all along. I cleared up the Lupus taking wheat out of my diet, also took out dairy but the Fibromyalgia I was diagnosed with has never changed. I have sore throats, chronic muscle and joint pain and fatigue that never goes away. The infections makes more sense. This all started with infections, one after another after a fall at work. Throat infections, kidney infections, lung infections, gut aches, throwing up blood and severe bloody diarrhea. It was like I had a virus that kept going through my organs and has never went away to this day. I am looking for a permanent solution. Because candida, pylori, herpes virus and others hide in the lining of the gut, we have to kill them off when active. We then need to fire up our immune system with certain herbs and the right food so we can heal our microbiome to keep invaders in check. I read that candida hides deep and there is a way to bring them out and cut their heads off with some bone something (didn’t really understand what she said), then cleanse and rebuild. The trick is to kill them off when they are active. I believe sugar feeds them and I have had a sugar addiction most of my life. Interesting to find out about the arginine-lysine foods as I eat a lot of nuts and seeds and used to eat a lot of chocolate. I am not sure where to get the test for the virus and bacteria’s in Canada though. Great info, thanks for sharing ladies. My son is 6 yo.. He had four cases of strep throat last winter.. ENT spec. Decided to take tonsils and adenoids out last March in hopes of no more Strep..this winter 2104/2015 he has had Strep at least 4 times I don’t think he’s really ever gotton over it.. Numerous antibiotics have been giving and he’s still Strep positive.. They just ran blood work last Monday and they called today saying he has H-pylori.. Could the Strep and this be related? Also has lymp nodes on neck that are prominent. Always has a tummy headache and sore throat..they are starting two antibiotics tomorrow and acid reflux meds to help out.. Just wondering if the H-pylori is causing the Strep? And if we are headed in the right direction on the meds to treat the H-pylori? Thank you! Debbie- Here is some information you may find interesting. I was diagnosed as hypothyroid 10 years ago after countless years of suffering and countless conventional doctors’ not recognizing all my classic symptoms. A recent functional tested for numerous infections. I have an “old” but “active” Epstein-Barre virus. He’s mystified why my EBV antibody count is so very high. I’ve been needing to take 2 Excedrin tablets at least 3 times a week for quite some time now. I’ve researched EBV and found no suggestions other than lots of water, good sleep and eating well. You are doing an exemplary job helping others to be their own advocates and I thank you for that. God bless! Anne- Without going into too much detail, the first of the crucial defining moments in my disease development may have started during my undergraduate studies at the University of Illinois. Due to the communal living setting of dormitories (and less than stellar hygiene habits of most college students) I had recurrent strep throat infections and even contracted mononucleosis, a viral infection caused by the Epstein-Barr Virus (EBV), which is implicated in triggering many autoimmune conditions. I received multiple courses of antibiotics as well as flu shots (which may be associated with EBV infections), and started birth control for menstrual cramps. I was diagnosed 21years ago with hypothyroidism put on levothroxine. I was not advised to do anything other than take med and watch the weight fall off. I took meds weight stayed with me. Primary care drs have monitered and dosed me. Three years ago I was sent to an endocrinologist since my numbers stayed off &extreme fatigue. Ending diagnosed me with Hashimotos upped levothroxine rechecks 2-3 months. She watches my vitamin D but that seems about it. Never in the 21years since diagnosis has any Dr ever mentioned the things I am reading about on this site. I now weigh 275 pounds, I have high no, take a fluid pill, battle with potassium staying high enough…currently take 100 news a day to stay close to normal have it checked every two wks, have racing heart rate which I take med for, allergy is my middle name so I take stretch in am. & xyzal at nite, restless leg med, ambien to sleep. I take 2000 units of vitamin D daily along with my multivitamin. I take a magnesium to help retain the potassium. I am taking two different bp meds. Well three if you count the one for racing heart. My legs absolutely hurt so bad from behind my knees downward that I cry every night. I do take Etodalac for arthritis. Seems my joints are hurting so much worse lately. I have contributed that to stress as my husband of 24 years has moved out and wants a divorce. I am 47 years old but there are days I would swear I am 90. I can barely get around all my joints crack snap and pop from neck to ankles. I also take an antidepressant although I can’t imagine why LOL I just want to feel better …why has my Drs not mentioned any of the ideas I read here. I am confused I stay foggy mentally and also have trouble falling asleep while driving. Each Dr points me to use my CPAP which I don’t cause it ALWAYS makes my sinus infections worse. I keep sinus infection alot of course I am allergic to everything on the list. I take the allergy shots that I have took periodically since I was 9 years old. What are your thoughts? Angie- When it comes to weight gain these are a couple of things to think about. Elle- Work with your doctor to test for infections, and use antibiotics judiciously, as they can be incredibly dangerous when used incorrectly and lead to multi-drug resistance, an elimination of the beneficial bacterial flora and numerous side effects. There is a multitude of different antibiotics, each with a different group of bacteria they target, and each with their own set of side effects. Blindly taking antibiotics without knowing the cause of your infection may end up inadvertently destroying the beneficial bacteria while letting pathogenic and opportunistic bacteria thrive. Does licorice candy get rid of H. Pylori? As far as probiotics, will eating yogurt every day help? I read your articles because I have hypothyroidism and so does my husband. He has hashimotos though and so does my mother in law. I have rheumatoid arthritis which you know is also an autoimmune disorder so this article has re-inspired me to keep searching for the cause of my RA. In 2012-2013 I was working a nursing job that was killing me! I was run down, an insomniac and continued to ignore my health because I thought I would just bounce back. Oh how I was so very wrong!! I had pneumonia, bronchitis and sinus infections multiple times and kept bugging my dr to look further into my poor health. Looking back now, I wonder what damage I did to my body and what all these infections and rounds of antibiotics did to me!! I also suffered from gerd and was on a proton pump inhibitor for years at that point. I was gaining weight rapidly and couldn’t figure out why as I had tried to eat healthier and had always been a skinny person who could eat anything. My life is drastically different now for the better in that I stopped smoking and socially drinking, I exercise and eat clean (paleo, gluten free, organic) and I am slowly trying to get my life back. My RA and fibromyalgia are tuff obstacles though so any advice, tips etc would be greatly appreciated!! Hi all! I have had recurrent EBV infection with VERY HIGH titers. Diagnosed with Hyperthyroid 30+yrs ago, off and on Methimazole since, diagnosed with Fibromyalgia, Myofascial Pain syndrome and Chronic Fatigue 15 yrs ago. Interesting thing is that I lived in East Africa in my teen years in the 60’s and had numerous parasitic illnesses. Really starting to wonder how all this is tied together. Have suffered with IBS since before it was called that which started with amoebic dysentery at 15. My RA levels and gluten tolerance levels are low. Had a horrible time with Mono in early twenties and some sort of oral herpes infection as an adolescent, I only remember that it hurt to drink water! I have had too many other diagnoses to list here. Would appreciate any and all recommendations, thank you! Additionally, animal fat and broths, soups and stews support the body’s ability to suppress the viruses. Monolaurin/lauric acid, one of the components of coconut oil, has been found to be active against the Epstein-Barr virus. Replication of many viruses including Epstein-Barr is inhibited by glycyrrhizic acid, an active component of licorice root. Quercetin, Co-Enzyme Q10, N-Acetylcysteine, and glutathione were also reported to be helpful in chronic fatigue syndrome because of their anti-viral properties. Here are a couple of articles you may find helpful!! Wow Izabella our stories have a LOT of similarities! I’m wondering if you have or know of a list of pathogens besides the 3 listed (h pylori, Lyme, yersinia) that are known or suspected to cause the same molecular mimicry of the thyroid? Stool tests for h pylori and yersinia are negative and Lyme is so controversial…I’ve treated it for years with “LLMDs” but believe I really don’t have it, as I have never improved with Lyme tx (and certain infections cause cross reaction). Stool tests show I have a high amount of klebsiella species, and I’ve found conflicting and variable info about it with some sources saying it’s commensal and others saying it’s pathogenic. Any thoughts? Molly – I am unable to give out any direct personal medical advice here on this page. I highly recommend that you work with a functional medicine clinician. It’s a whole medical specialty dedicated to finding and treating underlying causes and prevention of serious chronic disease rather than disease symptoms. Have you ever worked with anyone wiwth Hasis and Burning Mouth that feels like poison is coming right out of your mouth! Infrared Hot House has helped but also seems to be pulling out toxins. What could this be? I am working with a funtional chiro who understands my MTHFR issues and is doing neuropathy therapy. Please let me know what you might think that this is. All silver fillings out recently but might still be in tissues. Have EBV and Herpies Simplex 1 and working on the gut for years! I’ve had a goiter that fluctuates in size-pretty much since I was a toddler. I also had hypothyroid symptoms growing up and was finally put on synthroid in my early 20s. It didn’t work. I went gluten free at 25, then full paleo at 27. I tried armor and other ‘thyroid supplements’ during this time. Nothing was working. My blood work was and still is normal yet my goiter is still here. I did the iodine protocol for almost two years-great results but goiter size never changed. I’m at a loss and feeling totally hopeless. Caroline – thank you so much for following this page. Hi there, I keep reading that by far the most common type of hypothyroidism is hashing toss&, so what about plain old non autoimmune hypothyroidism? I have what I highly suspect is leaky gut, and possibly other autoimmune conditions but just hypothyroidism. Also your series seemed to focus on hashis but that might have only been the parts I saw. Any thoughts on standard hypothyroidism? Thank you! Kahu – thank you so much for following this page. If I had gut infections or other infections, wouldn’t it show up on blood work? CBC with differential? Also what could it mean if alkaline phosphatase was high instead of low? Kerri – thank you for following this page. Please, understand that due to liability issues, I am unable to answer specific medical questions. Thank you so much for your website and all the information you provide and the queries you take time to answer. I’m about to buy your books. I’ve only recently been diagnosed with Hashimotos (I basically had to tell my doctor and get her to get a second opinion when I noticed my anti TG was high on a blood test from over a year ago and nobody had picked this up. Anti TPO normal) and i have had some bad experiences over the years with doctors and endocrinologists in France where I live since being diagnosed hypothyroid in 2009. I’ve found a nutritionist and functional médecine practitioner but we haven’t got started yet as she is away for a couple of months. I’m kind of going it alone right now and it is such a minefield. Every time I read something and decide to explore that line of treatment I seem to then read something conflicting. I am taking many of the supplements you recommend and have begun to feel quite a bit better but was still suffering a lot of gut problems. I read about oregano oil and decided to try that but almost immediately suffered symptoms of candida die off. I’ve been aware for a few years that I have a candida problem that needs to be addressed and this seemed like a convenient effect along with trying to rebalance my gut flora. Thankfully the die off symptoms are subsiding after a few days. I know you’re supposed to stop as this is a sign that your body is struggling with the toxicity of the dying candida but I was worried that stopping would encourage whatever else is wrong in my gut. But I’m flying blind aren’t I? i seem to be obsessively trying to take anything and everything I can get my hands on and that makes sense to help my situation but I am now confused. Is oregano oil killing everything in my gut and therefore a bad thing? I started taking Align today but I don’t know if that is pointless because the oregano oil will kill the b. infantis 35624 and having just read several more of your articles and posts I don’t even know whether that is the strain I should be taking! I’ve taken one so far as only received it today and had a churning stomach and gas ever since. But that could be down to eating cheese! I have cut down but not eliminated dairy. Maybe I am trying to do all of this too fast, I am impatient and fed up of being so unwell. I am now strictly gluten free but it’s not solving all the problems at all. Maybe I need to calm down, read your books and stop spending money on supplements left, right and centre, so that I can formulate a better plan. I don’t trust anyone to help me here. French medicine seems not to take any notice of the gut and the endo I’ve seen is worse than useless. I don’t know what the point in one will be for me now so don’t even want to try another though I’ve been referred. I went my own way and started taking Thiroyd three months ago because nobody would listen to me or let me have T3 and you can’t get NDT in France, it’s illegal!!! Sorry, this comment devolved from a simple question about whether to take Align whilst treating with oregano oil or wait till after. If any body is “listening” thank you. Any advice welcome. Carrie – thank you for following this page. Not everyone will need every single supplement! In fact, I believe that most nutrients should come from the diet. This is why I always list food sources in the book and on the blog, for most of the nutrients, vitamins, minerals and probiotics that are depleted in Hashimoto’s. However, some may require/prefer supplements and the supplements on the website are a resource for those that do. I recommend getting tested for deficiencies to determine your need for a supplement as instructed in the book and blog. I also don’t recommend starting multiple supplements all at once. I recommend starting one at a time, and then adding another a week or so later once it has been confirmed that the first supplement is not causing any harm. I’m currently reading your book and while I understand the idea behind taking Thytrophin PMG, it raises 2 questions for me. -Is it possible that it would cause inflammation in the gut and/or impact digestion as the food that is being digested is being simultaneously attacked? -Since this pill contains thyroid DNA, would it prompt the body to increase its supply of antibodies? Manh – thank you for following this page. For questions pertaining to the protocols please contact my team at program@thyroidpharmacist.com and they will be happy to help you. It has been difficult to find a lab service in rural Canada such as the one you recommend for a comprehensive stool sample. Have you any recommendations? Kirsten – thank you for following this page. Please contact my team at info@thyroidpharmacist.com and they will be happy to help you. Hi Dr. Wentz, thank you for giving me hope. I’ve been in a hashimoto flare since diagnosed in 2016. Seems I’ve gotten worse lately, extremely tired, joint pain you name it. 2 weeks ago I was diagnosed with a UTI, normal should be between 2-5 my WBC was 29. It was retested and now WBC is 13 so now on a round of cipro for 5 days. I didn’t have the normal burning and pain that normally comes with a UTI. Who knows how long I’ve had this. I am praying and hoping that once this is gone my body will calm down. Your articles give me hope and hope is everything when you feel so poorly all the time. Jeannie – thank you so much for your support. I am so sorry you are not feeling well right now. Please understand I am not able to respond directly to these types of questions here. I highly recommend that you work with a functional medicine clinician. It’s an entire medical specialty dedicated to finding and treating underlying causes and prevention of serious chronic disease rather than disease symptoms. I have always wondered about what triggered my autoimmunity. Shortly before I started having trouble I got a severely painful case of strep throat and had to go to the ER. One strange thing was that I never got a fever. After that I developed Hashimotos and LPP a scarring auto immune hair loss. I am a 26 year old female and I am so sick of doctors not knowing what to do with me. Do you think strep could have played a part for me even though it’s not the infection associated with Hashimotos? Jamie – thank you for reaching out. The most common triggers in Hashimoto’s are: nutrient deficiencies, food sensitivities, intestinal permeability (leaky gut), stress, an impaired ability to get rid of toxins and in some cases, infections. Optimizing your health starts with food. Figuring out which foods nourish you, and which ones cause you harm is the single most important thing you can learn in your health journey. I was diagnosed with Hashimoto’s and hypothyroidism about a year and a half ago. After seeing my MD and Endocrinologist, both who told me there is nothing more to do but take Levothyroxine and test again in 12 weeks, I began seeing a Naturopath and reading through your Hashimoto’s Protocol book. Since it was only a short time since I began the Levothyroxine and I could barely function I quit taking it on my own. My Naturopath started me on several supplements like Selenium, B-Complex, Vitamin D, and Magnesium, which I am still taking. I also did a complete overhaul of our food and have been on a whole food diet since. We got water filters and I also changed out my beauty products and most household products. I feel better and so does my family, but I was still experiencing gut problems and fatigue. My Naturopath gave me several things to try at different times that did not help and in fact made it worse (Ashwaghanda, Thyrocsin, Biogest). The last, while taking the Biogest I started Nature-Throid. I noticed a lot of pain in what he called the RUQ and headaches. My labs came back decent, although my antibodies doubled. Since I had the same symptoms he increased it. He said since the fatigue hadn’t gotten significantly worse it was probably not EBV reactivated (I had it in college). With the increased dose, again, the same symptoms, but increased fatigue and confusion. I started to wonder if the pork had anything to do with it, because when I had it for breakfast I would get a headache. Well, my next labs went wonky. My TSH jumped to 22 while my T4 dropped to .64 and T3 was within range at 2.2. So he thought I just wasn’t tolerating the medicine and put me back on Levothyroxine. Much worse. I felt like I was back where I started a year ago. He said since I had such a reaction to it, I could stop it. So now I am following your liver, adrenal, and gut guide-just started the gut protocol, laying off the pork and almonds (bloating, etc.) and if I don’t see improvement from there I guess I will need to request to be tested for an infection or something else. Is there anything else you can recommend to try or check that may explain the sudden change in my labs and where to go from here in regards to the fatigue and gut problems? Catherine – thank you for sharing your thyroid healing journey here. We know that intestinal permeability (aka leaky gut) is present in every case of autoimmunity and often precedes the development of Hashimoto’s. Symptoms of leaky gut may include bloating, diarrhea, constipation, stomach aches, acid reflux and irritable bowel syndrome. According to the Institute of Functional Medicine, many people develop IBS 5-10 years before an autoimmune diagnosis. I was one of them and didn’t take my gut health as seriously as I should have. Gut problems are often caused by infections like H. pylori, parasites like Blasto, SIBO, an imbalance of bacteria, and enzyme deficiencies or food sensitivities (especially to gluten, dairy, and/or soy). Even stress can be a factor in gut permeability. Here is an article you might find interesting. Your article here on Infections seems to mostly relate to TPO. Would you say these three infections could also be the root cause of high thyroglobulin antibodies? I am asking because I was diagnosed with Hashimotos about a year and a half ago. So I changed my medication (to T4/T3) and my diet (no gluten, dairy, soy, and just a little sugar) which made my symptoms of low energy, brain fog, and hair loss go away. (yay!!) However, my thyroglobulin antibodies are going up again, after falling initially by a half. My TPO numbers are continuing to fall. So I thought I would test for an infection, but maybe that is not necessary if the infections are the root cause of high TPO and not high thyroglobulin antibodies. Any thoughts? Mary We know that intestinal permeability (aka leaky gut) is present in every case of autoimmunity and often precedes the development of Hashimoto’s. Symptoms of leaky gut may include bloating, diarrhea, constipation, stomach aches, acid reflux and irritable bowel syndrome. According to the Institute of Functional Medicine, many people develop IBS 5-10 years before an autoimmune diagnosis. I was one of them and didn’t take my gut health as seriously as I should have. Gut problems are often caused by infections like H. pylori, parasites like Blasto, SIBO, an imbalance of bacteria, and enzyme deficiencies or food sensitivities (especially to gluten, dairy, and/or soy). Even stress can be a factor in gut permeability. Here is an article you might find interesting. I started following your 90 day protocol just under 3 weeks ago. Around ten days into the liver protocol I caught the flu and have been floored with it for ten days now. I would like your advice on how to proceed? I have been continuing with the liver protocol but Have had to take paracetamol for my symptoms and temperature. Is this the right thing to do, should I take a break or move on to the adrenal protocol? I want to give this my best shot. Michelle – thank you for following this page. For questions pertaining to the protocols please contact my team at info@thyroidpharmacist.com and they will be happy to help you. Can you have H. Pylori or another bacteria and not have stomach pain? I have Burning Mouth Syndrome and Hashimoto’s and I would love to figure out how to heal my mouth. I have cut out gluten, dairy, and a lot of sugar. I eat a lot more veggies than I used to, take Dr. Axe supplements for Leaky Gut and Thyroid function. And Vitamin D supplement (5000IU). I also use bone broth powder in smoothies and collagen powder. I am taking Armour Thyroid, but it is over-correcting my thyroid at this point, so my doctor said to not take it one day a week. I fainted recently, and think it has something to do with not taking it for a day, then taking it again. If you have any suggestions, I’m all ears:) Thank you! Sarah – thank you for reaching out. We know that intestinal permeability (aka leaky gut) is present in every case of autoimmunity and often precedes the development of Hashimoto’s. Symptoms of leaky gut may include bloating, diarrhea, constipation, stomach aches, acid reflux and irritable bowel syndrome. According to the Institute of Functional Medicine, many people develop IBS 5-10 years before an autoimmune diagnosis. I was one of them and didn’t take my gut health as seriously as I should have. Gut problems are often caused by infections like H. pylori, parasites like Blasto, SIBO, an imbalance of bacteria, and enzyme deficiencies or food sensitivities (especially to gluten, dairy, and/or soy). Even stress can be a factor in gut permeability. Here is an article you might find interesting. I have your root cause book and since then I have been trying to find my triggers. I tested negative for h pylori but when I saw two ladies that do kinesiology they said I had h pylori & that needed to be sorted first. I cut dairy out & 90% sugar (I have celiac so gluten free already for 6 years) and started taking a thyroid supplement & ginseng that the kinesiology ladies recommended. I started to have more energy initially & then I became hyper & feel terrible. I stopped taking everything supplements wise and had blood tests, my tsh was 0.08 and free t4 was 24.8. My dose for a long time has been 175mcg (I weight 5,8 at 56kgs, I believe that to be double the dose for my size) my antibodies are 360, they were 580 at diagnosis 7 years ago. I feel at a complete loss and don’t know what to do as my doctor doesn’t know anything about the condition, that’s the only other time my antibodies have been tested. I feel like I’m in a flare at the moment & have lots of infections going on. I don’t know what dose I should drop down too because taking any makes me feel worse. I forgot to take it for two days (was dropped down to 150mcg at this point) and it was the best I’d felt in longer then I could remember. I don’t know if I’m going into remission and it’s the medication making me feel awful or if I’m having a flare. I can’t find a functional doctor in my area. Any information or suggestions would be much appreciated. Grace – thank you so much for sharing your journey with me. I am so sorry your are struggling with this. I understand how hard this can be. <3 I believe that everyone needs to find a practitioner that will let him/her be a part of the healthcare team. You want someone that can guide you, that will also listen to you and your concerns. You want someone that’s open to thinking outside of the box and who understands that you may not fit in with the standard of care. It's a good idea to ask some standard questions when contacting a new doctor for the first time. Something else to consider is you can work with a functional doctor remotely, via Skype. You could also contact your local pharmacist or compounding pharmacy, who may be able to point you to a local doctor who has a natural functional approach. But I encourage you to keep looking for the right one for you! Here are some resources you might find helpful. I am starting to wonder if I need to be tested for gut infections. I have been on Hashimoto’s Protocol for 3 months and still feel chronically tired, plus am dealing with other issues. I am not on the right amount of thyroid. I take Armour Thyroid, but my test results showed that my free T3 are too low with Reverse T3 too high, so my Dr prescribed a T3 slow release compound, but whenever I try to take it, I go Hyperthyroid. She told me it’s because my adrenals need to heal, but after resting and doing the appropriate diet for this long, I would think they should be healed up. I just got diagnosed with silent reflux (LPR) reflux which is a shock to me. I’ve only started having problems with swallowing for the past 6 months or so, but now my voice is hoarse and I cannot think why I would get it – I haven’t eaten gluten or dairy for about 8 years, but it almost seems worse since doing Hashimoto’s Protocol diet. So, it’s making me think that maybe an infection is behind it. There are no functional Dr’s close by where we live, so that isn’t an option right now. I’d love to hear your thoughts. Thank you. Mary – thank you for reaching out and sharing your journey. I am so sorry to hear you are struggling. Hashimoto’s is a complicated condition with many layers that need to be unraveled. While conventional medicine only looks at each body system as a separate category and is only concerned with the thyroid’s ability to produce thyroid hormone, Hashimoto’s is more than just hypothyroidism. We know that intestinal permeability (aka leaky gut) is present in every case of autoimmunity and often precedes the development of Hashimoto’s. Symptoms of leaky gut may include bloating, diarrhea, constipation, stomach aches, acid reflux and irritable bowel syndrome. According to the Institute of Functional Medicine, many people develop IBS 5-10 years before an autoimmune diagnosis. I was one of them and didn’t take my gut health as seriously as I should have. Gut problems are often caused by infections like H. pylori, parasites like Blasto, SIBO, an imbalance of bacteria, and enzyme deficiencies or food sensitivities (especially to gluten, dairy, and/or soy). Even stress can be a factor in gut permeability. Here is an article you might find interesting. I finally found an amazing doctor who advocates the theories in your book. That was one of my main pre-requisites. She is awesome, and everything I’ve been dealing with, she understands. She is a Hashimoto’s specialist in Altanta, and I drive about an hour and a half to her office. I know God led me to her! Her name is Dr. Bullington. I’ve been through MANY doctors. She finally did the right bloodwork, and we now know that I have one copy of the MTHFR gene mutation, I have systemic candida that she is treating with antifungals, liver support protocols, and is getting my thyroid medicine on the RIGHT track for the first time in a long time. She uncovered a UTI that I was trying to treat naturally. She put me on an antibiotic, which I am going to pick up today… I’m really praying this will not do more harm than good. I’ve literally not taken an antibiotic in more than 10 years. I try to do everything natural that I can. However, in this case, to rid my body of a UTI that’s been around too long, she is putting me on this. I’m so thankful for you advocating for us to find a GOOD doctor. This has been so amazing. I follow your general protocols for the most part, and I feel like God led me to you also. Since my Hashimoto’s diagnosis, this has been a journey to FIND the root cause, but I also know that each step is taking me one step closer to healing. I believe the underlying candida and the UTI may be what has been triggering my antibodies to go over 800. I’m excited to check them again in 4 months, on all these new natural supplements my doctor has me on, and see if they drop!! I can almost predict that they will be going DOWN for the first time in a long time. I can’t tell you how thankful I am for all of the labor that you put into sharing these life-changing recipes for those of us suffering from Hashimoto’s. I hope you are well! Thank you so much for your work! I am a long-term fan of yours and your book/articles have really helped me! Especially when doctors were dismissing me before I was finally diagnosed! I was wondering if it’s possible for Crypto to trigger Hashimotos/ Hypothyroidism? Sarah – thank you so much for your support! You are so sweet! <3 We know that intestinal permeability (aka leaky gut) is present in every case of autoimmunity and often precedes the development of Hashimoto’s. Symptoms of leaky gut may include bloating, diarrhea, constipation, stomach aches, acid reflux and irritable bowel syndrome. According to the Institute of Functional Medicine, many people develop IBS 5-10 years before an autoimmune diagnosis. I was one of them and didn’t take my gut health as seriously as I should have. Gut problems are often caused by infections like H. pylori, parasites such as Blasto, SIBO, an imbalance of bacteria, and enzyme deficiencies or food sensitivities (especially to gluten, dairy, and/or soy). Even stress can be a factor in gut permeability. Here is an article you might find interesting. The Biohealth 401H Pathogens tests for: Ova & Parasites x 4 (Trichrome stain) plus antigens to Giardia lamblia, Cryptosporidium parvum, and Helicobacter pylori. Plus culture x 1: Bacteria, fungi, yeasts, occult blood, Clostridium difficile: Colitis toxins A & B. The sample collection is over several days. The GI Maps Test includes the first comprehensive pathogens assay that is FDA approved, the GPP assay by Luminex Corp. Pathogen targets include bacteria, parasites and another first for the market, viruses. The panel includes opportunistic organisms, normal flora, parasites, and fungi. DNA/PCR techniques also allow for the measurement of antibiotic resistance genes and virulence factors that contribute to pathogenicity. The GI Maps tests for the same as the 401H test, however, recently, the GI Maps has now added “worms” for testing as well. The sample collection is just one time. I Have been living with chronic pharyngitis since the last 3 years. I was given antibiotics ,after 8-10Months I was diagnosed with hashimotos along with vitamin D insufficient. I cannot tolerate this every time I open my mouth in mirror I can see red spots on the neck wall.I am taking vitamin d tablets weekly.My anti tpo is also high 230.5 ..I don’t know what to do?Currently my tsh has come to normal,but I left taking medicines 4 months ago and in middle I went to aayurveda.And then I went to endocrinologist and he said he will check my TFT next month and start medicine if necessary..The ENT has given me medicines ,same medicines which I have been taking since beginning.I don’t know what is causing chronic pharyngitis. Sachin – thank you for reaching out and sharing your journey. <3 I am so sorry to hear you are struggling with this. Hashimoto’s is often a combination of food sensitivities, nutrient deficiencies, adrenal issues, gut issues as well as an impaired ability to get rid of toxins. Any of those things would prevent a person from getting better. Hashimoto's is very much an individual condition. While there are root cause commonalities, each person will have their own or in some cases, more than one root cause. You will have to start with the simplest modifications, by removing triggers, followed by repairing the other broken systems to restore equilibrium, allowing the body to rebuild itself. You will need to dig down to why the immune system is imbalanced in the first place and this will tell you how you begin to finally feel better, reduce your thyroid antibodies and even take your condition into remission.